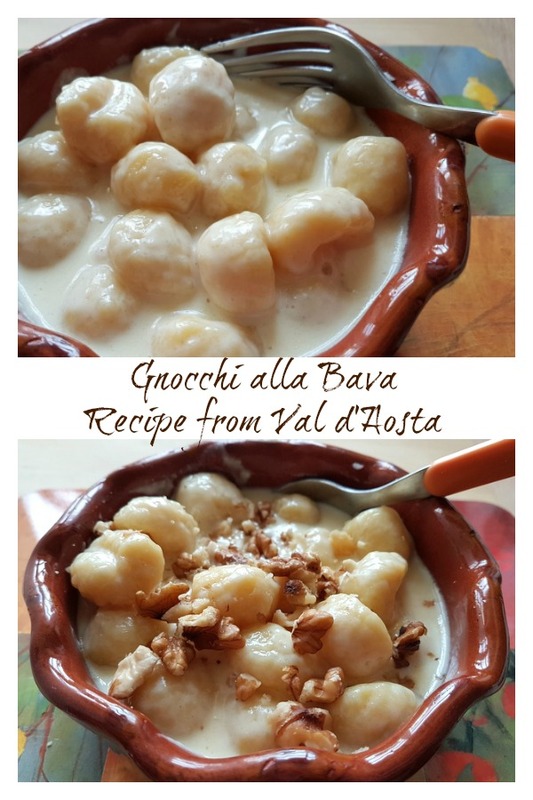 Gnocchi alla Bava; Recipe from the Val d’Aosta. Soft and delicate pillowy potato gnocchi go so perfectly with the stronger flavor of rich and creamy Fontina cheese in this gnocchi alla Bava recipe; a fabulous example of typical hearty mountain food from Northern Italy. Gnocchi alla bava is a traditional recipe and first course (Italians say primo) from the Val d’Aosta (Aosta Valley) and Piemonte (Piedmont). 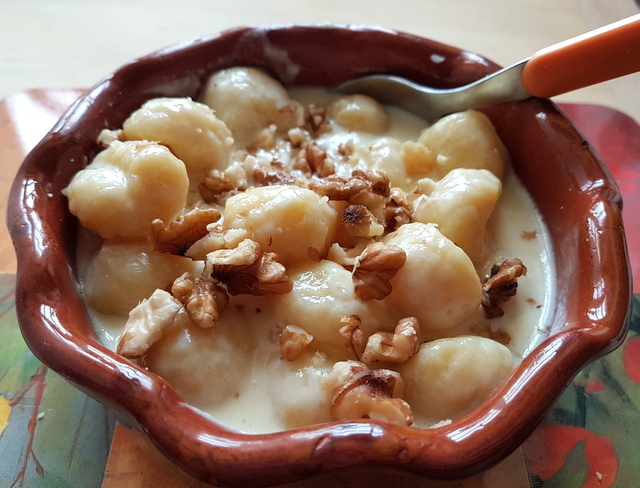 This creamy and nutritious dish can be prepared with classic potato gnocchi or, as per the tradition of the Aosta Valley, with gnocchi made with buckwheat flour. I used potato gnocchi this time, but am planning to make some buckwheat gnocchi very soon! A little gnocchi alla bava history. According to food historians, Giovanni Vialardi, the famous head chef of Kings Carlo Alberto and Vittorio Emanuele II, included this recipe in his 1854 book of gastronomy, The Treaty of Cooking and Pastry. However, at that time, the royal kitchens were much influenced by French cuisine. 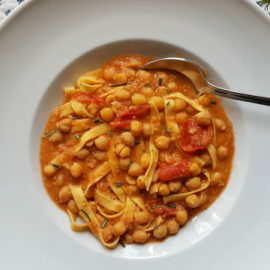 Vialardi called this recipe ‘chenelli alla savoiarda’ from the French term ‘quenelle’ and with reference to Savoy, the historical region where the Italian royal family originated. 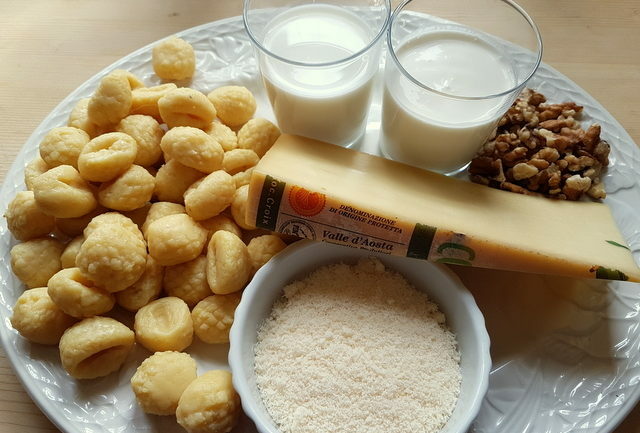 In the Val d’Aosta, the cheese that is used in gnocchi alla Bava is traditionally Fontina DOP, the most loved and well-known cheese of that tiny Northern Italian region. Fontina is an excellent fresh cheese, but especially popular in cooked recipes. It is a fabulous melting cheese that Northern Italians use in their version of cheese fondue (fonduta). Fontina has a strong and decisive flavor, which goes so well with the delicate taste of the gnocchi. The sauce in this gnocchi alla bava recipe is probably the best cheese sauce ever! So, if you can find Fontina, I really recommend you use it to make this dish! If you can’t find Fontina, there are other cheeses from this part of Italy that are and can be used in this recipe. In Piemonte, they often make gnocchi alla bava with Toma. Other popular cheeses are Raschera, Gorgonzola, Maccagno or Castelmagno. You can also use Emmental or Gruyère. Making this gnocchi alla Bava recipe. Like so many other pasta dishes, gnocchi alla bava is super simple to make. You can use homemade potato gnocchi, which will mean it takes a little longer to prepare. However, good quality ready-made gnocchi work well too! I usually prefer to make my own potato gnocchi. If you want to do the same, click here for my Italian potato gnocchi recipe. In the basic, original recipe the sauce for potato gnocchi alla bava contains only Fontina cheese, fresh cream and milk. It takes just minutes to prepare! However, there are versions of this recipe that add nutmeg or black pepper to the sauce. I didn’t. What I did was add some chopped walnuts to the dish before serving. 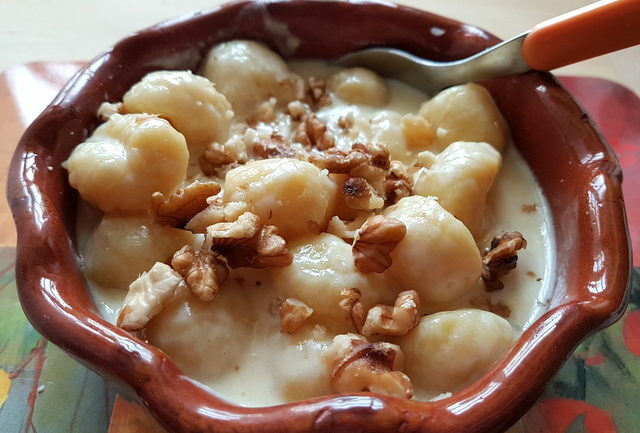 I love the combination of walnuts with cheese and gnocchi. I think it’s also possible to add some crispy pancetta or chopped ham if you want a bit of meat or perhaps some cooked spinach to make it more nutritious! 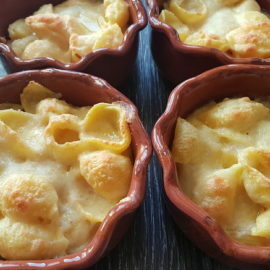 Some people also bake gnocchi alla bava with a sprinkling of cheese, such as grated parmigiano, on top before serving. I did this with the leftovers and it was delicious. However you decide to serve this gnocchi alla bava recipe, it will definitely be a winner with both guests and family. In Italian, the word ‘sbavare’ means to drool! Although I don’t know the exact origin of the name of this gnocchi recipe, it is definitely drool worthy! Perfect comfort food for those cold winter days when we really need our food to warm us up! If you do try this gnocchi alla bava recipe, I’d love to hear what you think. Please write a comment here on the blog or post a comment on the Pasta Project Facebook page. Gnocchi alla Bava recipe is a fabulous example of typical hearty mountain food from Northern Italy. These pillowy potato gnocchi smothered in the best cheese sauce ever are heaven. 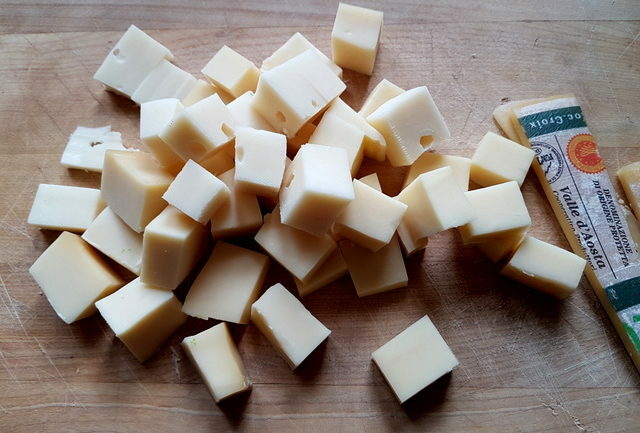 Cut the Fontina cheese into chunks. 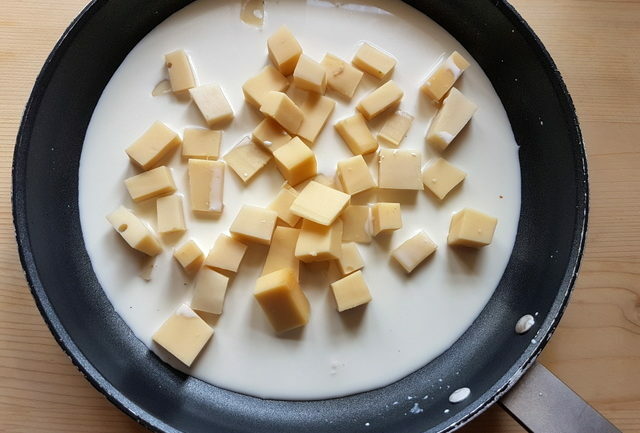 Put the pieces of Fontina in a saucepan or skillet together with the milk and cream then melt everything on a low flame, stirring continuously until there are no lumps. 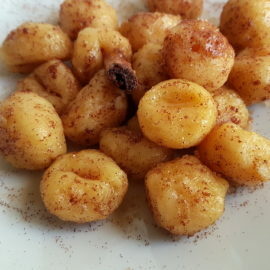 Cook the gnocchi in the boiling salted water, then remove them with a slotted spoon as soon as they rise to the surface. Add the gnocchi to the cheese sauce and mix everything together well gently. Serve with chopped walnuts and grated parmigiana as required. Cooking times don't include making homemade gnocchi. You can also bake gnocchi alla bava sprinkled with grated Parmigiano for 15 minutes before serving. You share one incredible recipe after another! I sent your page to my Sicilian mother-in-law and she was blown away by your dishes! This one tops the charts! Absolutely amazing! What a lovely comment, thank you Krista! I’m thrilled both you and your mother-in-law like my recipes! Yes this one is super yummy and easy to make too! This recipe looks fantastic. Though I have not had gnocchi before. But would love to try it. Thanks for sharing! One thing I’ve noticed is that I’ve never tried Fontina cheese before. But if it comes from Italy I can imagine how tasty it may be, particularly if used in a dish like this gnocchi. Delicious recipe with a great story. So far, recipes from Northern Italy win (for me). This potato gnocchi is a great example. And I can imagine how soft and inviting this dish is in real life. I have no choice but try it! I love anything with cheese, I would love to try this recipe. I love how versatile this recipe is. You can top it with just about anything! My husband is a big fan of gnocchi so I know I need to make an extra batch of this recipe. And of course, adding crispy pancetta makes this even better! Amazing looking recipe. It would make the perfect meal for my family. Thanks for sharing this recipe. I just want to take a big bite of that! The sauce looks absolutely heavenly and gnocchi so hearty and yummy. So creamy and delicious! I wish I had a big bowl of this right now. I can’t wait to make this simply delicious gnocchi for my family! Thank you dear Kelly! Yes, this is a really creamy and delicious dish! Also pretty simple to make so great for family meals! That cheesy white sauce looks so creamy and delicious. Absolutely perfect with the gnocchi. Perfect comfort food! 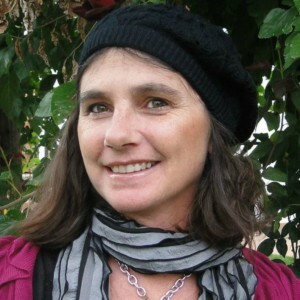 Thank you cara Stine! 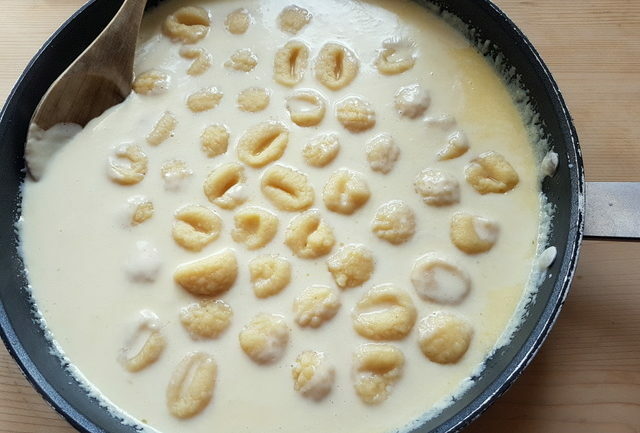 Fontina really makes the best cheese sauce and with gnocchi the combination is so delicious and comforting! That sauce really does look like the best ever! So perfectly decadent. Definitely putting this on my menu soon! Amanda you will love this dish! It’s so creamy and delicious! 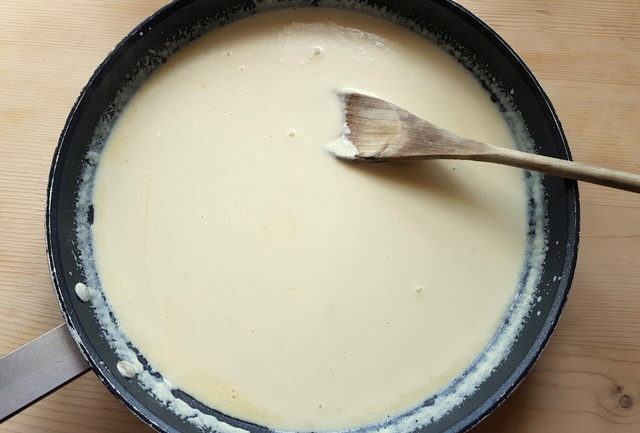 I love using Fontina to make a cheese sauce. It’s the best! I’m sure you will love gnocchi Fred! And in my opinion the best way to eat them is in a cheese sauce like this one. I hope you’ll try it! I love fontina cheese and seeing your cheese sauce makes me want to take a taste. I haven’t made gnocchi for years. This looks like all kind of cheesy goodness right here. The perfect food for comfort eating. All I need is a glass of wine, and this would be the perfect dinner for a Saturday night. I love Gnocchi in a cheesy sauce so this looks amazing to me. I have never heard of making gnocchi with buckwheat so I am going to have to look into that as that sounds super interesting! Gnocchi is hands down my favorite pasta! I usually have it with red sauce or Parmesan and butter, but this recipe sounds amazing! I love Fontina – making this ASAP!! 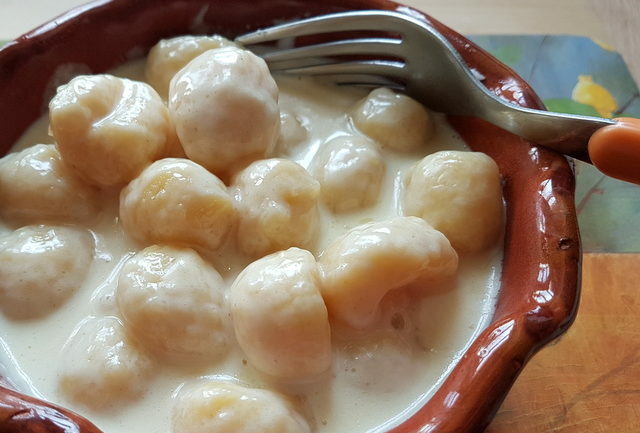 I love gnocchi and it sounds amazing in this creamy sauce. The walnuts are such a great touch! I love walnuts in gnocchi too! This recipe looks amazing! This looks just incredible. 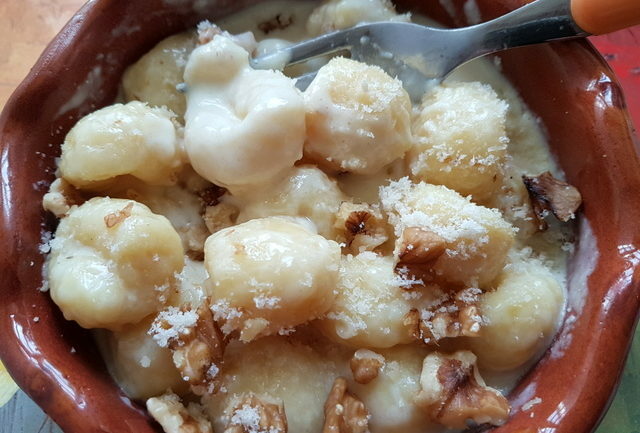 I have a weakness for gnocchi and I am loving how creamy and delicious this looks, especially with the fontina cheese. great recipe! This is basically my perfect meal! Absolutely delicious!